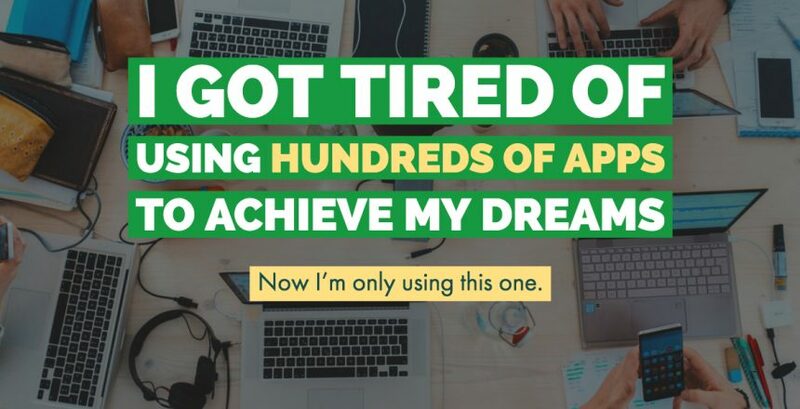 I got tired of using hundreds of apps to achieve my dreams. Now I’m only using this one. Attention entrepreneurs, business owners, and freelancers! If you’ve spent hundreds of hours searching for the perfect app, if you’ve “invested” all your money on paying for being in the cloud, if you’ve tried dozens of productivity tools, but they’ve all fallen short; then, today you will get to know the app that you’ve been searching for years and that you didn’t know existed. Have you ever had the suspicion that there are better ways – and apps – to organize your day, weeks, projects and life? I want you to know that there is one. But first, how about answering these questions? Do you dread the chaos that comes by using many tools at once? Are you tired of wasting your time looking for The productivity app? Do you want to stop spending hundreds of dollars on Google, Dropbox, Evernote, Jira, Asana or Trello? Do you want a money-saving, powerful app –something that was thought impossible– that gathers the best functionality of the others in one place? During the ten years that I’ve been a web designer and developer, I’ve tried out hundreds of productivity apps hoping to find the MOAPA1. From the powerful Asana to the useful Trello. From the versatile Jira to the simple Todoist. From Microsoft Word to Google Sheets and Open Office. From the almighty Evernote to the simple Mac Notes. From the spacious Dropbox to omnipresent Google Drive. I’ve used them all! These apps have served me right… but I always felt that they were missing something. And I never knew what it was until I met Notion. Notion is an all-in-one workspace. With this app you can write, plan, collaborate and organize your life and business. Notion gathers everything you need in one tool. Have you ever forgotten where you kept that important document? Was it on Dropbox or Google Drive? Or maybe it was in within that one folder on your PC’s desktop? I admit that this has happened to me many times. But that was my past. My present is different. Notion says it’s “4 tools in one”. But, being honest, it feels like more. With Notion you can create notes and documents; manage your knowledge databases; dominate your tasks and projects; and organize your spreadsheets and database in one place. So say bye, bye chaos. Writing within Notion is a pleasure. My fingers crave writing when I open the app. The truth is that I did not know that an app could inspire me to write. Notion did. With Notion, you can add To-dos, links, images, documents and other multimedia into your notes. You can also organize your information swiftly and without breaking a sweat. The functionality of Notes and Documents is designed to replace Google Docs and Evernote. Have you ever wanted to feed your own Wiki? Or how about having a knowledge base where you can keep your book summaries and ideas? Besides allowing you to create these types of documents, Notion will let you search within them quickly. This functionality is likely to help you replace Confluence and Github Wiki. I love lists. My heart yearns for organizing projects. While creating my projects, I feel dopamine filling my body while I’m creating its to-dos. Dopamine is the substance that tells your brain that you have done an excellent job. So look for dopamine every day. Notion makes organizing your projects fun and simple. I believe that project managers will love this functionality. And I know that you too could come to appreciate it. With Notion, you can replace Trello, Asana, and Jira. If you want to create workflows, if you need devise a potential & current clients database, if you aspire to be on top of the current state of your businesses, then Notion has a solution designed for you. This app will allow you to keep your records in order. You can also create unique workflows and manage your projects in the way you want. With Notion, you are your project’s God. You are its creator. Replace Google Sheets and Airtable with Notion. I’ve used Notion for a few months now. During this time, I came to noticed how its creators keep innovating consistently. Day after day they talk about what they are doing through their Twitter account and their blog. I’ve seen how extremely useful Notion is. It is the ideal tool for freelancers, as far as I’m concerned. But I also believe it has to potential to be a go-to app for larger companies and projects. Btw, Notions has an awesome price! Unleash the hidden power that you and your team of collaborators have. Make more deals. Because you can organize your sales funnel database easily. Increase your happiness levels. I say this from experience. Few things make me feel better than finding my files and documents quickly. Save money. Because of all the services that you can replace with Notion. Upload everything you want, since the paid version offers unlimited space and has no limits for file size. But why should you fire Google, Evernote, Dropbox, and others? You may already be spending $120 per year on Dropbox, $100 on Google Suite and $ 100 on Asana Premium. Maybe you’re also paying an additional $70 on Evernote. Save yourself all that hassle. With Notion you can dismiss the other services and save up for your upcoming vacations. Notion costs $5 monthly for an individual account. And $10 for each team members, for business plans. In addition, Notion offers a discount of up to% 20 if you pay the full year. Therefore, you could end up paying $ 4 a month for an individual account. It is time to put submit chaos into surrender. You deserve to manage your stuff without wasting your money each month. Do you want to be a highly productive person? Do you have the desire to fire Google or Evernote? Empower yourself, your projects and your money with Notion. Seize the day. Manage your assignments efficiently. And be informed of what happens in your company, businesses, and projects.